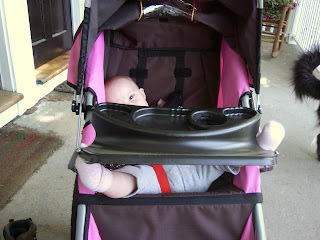 Margot's fancy stroller comes has a bar across the front that is at first used to secure the car-seat in the stroller, but then becomes the anchor for the snack/drink tray once she is big enough to sit in the stroller properly. However, "properly" may not be the right word, since she's come up with her own favorite method now that the tray is in place. She's a delicate flower!